Minor correction may be in order, DCC #69 - The Emerald Enchanter is in stores as of yesterday (if not earlier in places). Yep, I picked up my copy of Enchanter right when the store owner was opening the shipment box. That's because the official street date isn't until Monday; the stores mentioned sold their copies early. Emerald Enchanter is also now up for sale at RPGnow. I got my book off a reseller on eBay, who claimed the book was somehow missing the module 66.5. I didn't realize that 66.5 was different from the modules in the book. Oops. Is there a way to get a print copy of 66.5? 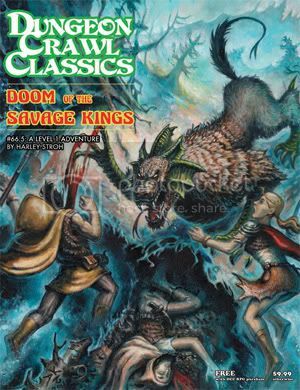 It is Doom of the Savage Kings, it was a "bonus" with the Limited edition of the core rulebook (black/gold cover). I assume it will come our separately eventually, but I'm not sure. It is a really good module, that I know. Oh, limited edition only. That esplains that! Thanks. I thought Goodman set "official okay for distributors to ship" days and considered the official "street date" to be whenever stores got it in from their distributor. Either way though, I have an in-store subscription set up so I will simply be picking up DCC materials the day after a truck drops them off at my FLGS - I just hope that doesn't mean my FLGS is doing something they aren't supposed to. How can I preorder #71A? I don't see it on the coming soon page. The module was also included in the first 2000 copies of the regular edition. DCC #72 is out now, and I updated the top post to reflect that. We're rapidly approaching the end of the original eight modules planned by Goodman Games. So what is the plan for phase 2 in the DCC RPG line? Is an annual in the works or eight more modules or.... ? I'd be surprised if we saw the first annual before late next year, since I'd think it'd be best for the game to have a good solid shake out period beforehand. But that's entirely speculative'd. Unless there are delays, I'm guessing Emrikol Was Framed! is out this week, as October begins next week. The Compleat Strategist usually gets this stuff very early. Edit: I was wrong. Next week it is! List updated to include DCC 75/76/77 plus Dungeon Alphabet. Marv, I can confirm that the second printing of the Dungeon Alphabet was indeed in 2010. Thanks, and ignore my post in the other thread (in the "general" section) where I asked the same question. Just a little update to the original post. Added the two new "coming soon" modules and updated the status of the one released in April. For DCC RPG, the Free RPG Day module features The Imperishable Sorceress, a level 1 adventure by Daniel Bishop! As the adventurers pass through a mundane door, they are startled to find themselves unexpectedly in a frozen landscape. A distant woman’s voice whispers a welcome, and the characters are thrust into a tale of spirits and ancient secrets. Nice catch, Rick! How could I forget that one?